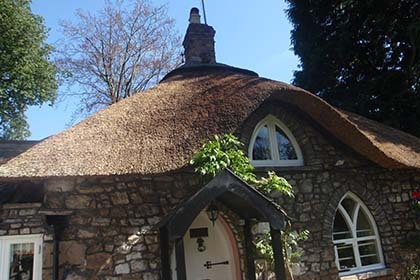 With over 30 years of experience in thatching, Paul Cook is a professional, reliable master thatcher, working throughout Crediton and the surrounding areas of Devon. Paul Cook Master Thatchers are an independent thatching company, specialising in high quality, affordable thatching services. Thatching is a skilled job, Paul Cook only uses the highest quality materials including straw, combed wheat reed and water reed. 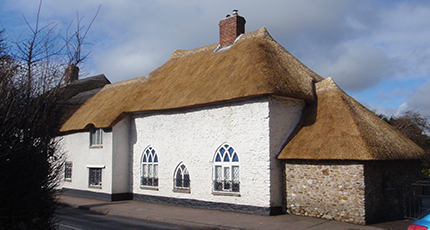 Offering thatching services for domestic and commercial thatching throughout Crediton and Devon. Thatching is the process we use. We offer thatch work repairs, new builds, thatch replacement, ridge work, thatch summerhouses and commercial thatch work.